^ a b "Founding of Nizhny Novgorod". nizhnynovgorod.com. Retrieved 2016-08-15. ^ "Мэром Нижнего Новгорода избран Владимир Панов". The Village (in Russian). Retrieved 2018-01-17. ^ "Contacts". adm.nnov.ru. Retrieved 2016-08-15. ^ "Nizhny Novgorod". calend.ru. Retrieved 2016-08-15. ^ "Нижний Новгород – Столица Поволжья и "карман России" | www.Nischni-Nowgorod.ru". www.nischni-nowgorod.ru (in German). Retrieved 2017-07-31. ^ "Д1 (2 чтение) ФЗ №186614-6 "О мерах воздействия на лиц, причастных к нарушению основополагающих прав и свобод человека, прав и свобод граждан РФ" – Система анализа результатов голосований на заседаниях Государственной Думы". Vote.duma.gov.ru. 19 December 2012. Retrieved 18 July 2013. ^ "Канатная дорога через Волгу "Нижний Новгород - Бор" начала работу". Российская газета (in Russian). 2012-02-09. Retrieved 2018-07-16. ^ "В Нижнем Новгороде во время грозы в канатную дорогу ударила молния". progorodnn.ru (in Russian). Retrieved 2018-07-16. ^ "List of Twin Towns in the Ruhr District" (PDF). © 2009 twins2010.com. Archived from the original (PDF) on November 28, 2009. Retrieved 2009-10-28. 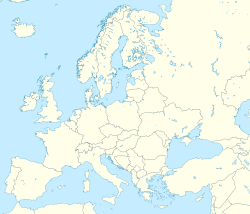 Nizhny Novgorod Oblast, also known as Nizhegorod Oblast, is a federal subject of Russia. Its administrative center is the city of Nizhny Novgorod. It has a population of 3,310,597 as of the 2010 Census. From 1932 to 1990 it was known as Gorky Oblast. Gorodets is a town and the administrative center of Gorodetsky District in Nizhny Novgorod Oblast, Russia, located on the left bank of the Volga River, 53 kilometers (33 mi) northwest of Nizhny Novgorod, the administrative center of the oblast. Population: 30,658 (2010 Census); 32,442 (2002 Census); 34,210 (1989 Census); 34,000 (1970). Bor is a town in Nizhny Novgorod Oblast, Russia, located on the left (northern) bank of the Volga River, across from Nizhny Novgorod. The two cities are connected by bridges built in 1965 and 2017, and by ferry service. Population: 78,058 (2010 Census); 61,525 (2002 Census); 64,512 (1989 Census); 51,000 (1969). 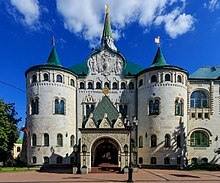 Arzamas is a city in Nizhny Novgorod Oblast, Russia, located on the Tyosha River, 410 kilometers (250 mi) east of Moscow. Population: 106,362 (2010 Census); 109,432 (2002 Census); 108,951 (1989 Census). Pavlovo, also known as Pavlovo-na-Oke, is a town and the administrative center of Pavlovsky District in Nizhny Novgorod Oblast, Russia, located on the right bank of Oka River in the northwestern part of the Volga Upland. As of the 2010 Census, its population was 60,698. Kstovsky District is an administrative district (raion), one of the forty in Nizhny Novgorod Oblast, Russia. Municipally, it is incorporated as Kstovsky Municipal District. It is located in the center of the oblast. The area of the district is 1,225 square kilometers (473 sq mi). Its administrative center is the town of Kstovo. Population: 112,823 ; 46,759 (2002 Census); 47,917 (1989 Census). The population of Kstovo accounts for 59.1% of the district's total population. Zavolzhye is a town in Gorodetsky District of Nizhny Novgorod Oblast, Russia, located on the right bank of the Volga River, opposite Gorodets, the administrative centre of the district, and 56 kilometers (35 mi) northwest of Nizhny Novgorod, the administrative center of the oblast. Population: 40,460 (2010 Census); 43,971 (2002 Census); 44,630 (1989 Census). Strigino Airport (Russian: Аэропорт Стригино is the international airport serving the city of Nizhny Novgorod, Russia. It is located on the outskirts of the city's Avtozavodsky District, 14 km southwest of city centre. Strigino is responsible for serving the 3,281,000 residents of the Nizhny Novgorod Oblast. Navashino is a town in Nizhny Novgorod Oblast, Russia, located on a branch of the Oka River, 10km east of Murom and 158 kilometers (98 mi) southwest of Nizhny Novgorod. As of the 2010 Census, its population was 16,416. Chkalovsk is a town in Nizhny Novgorod Oblast, Russia, located on the right bank of the Volga River, 95 kilometers (59 mi) northwest of Nizhny Novgorod, the administrative center of the oblast. As of the 2010 Census, its population was 12,368. Nizhny Novgorod railway station is a central station in Nizhny Novgorod, Russia. In terms of the amount of work performed, the 1st class station, and by the nature of the work performed, is a cargo station. It was opened on August 2, 1862. The Nizhny Novgorod tram network comprises 16 tramlines and uses a standard Russian broad gauge. Trams have been operating in Nizhny Novgorod since 1896, but services were interrupted for a few years following the 1917 Russian Revolution. Rozhdestvenskaya Street – a beautiful historic street in Nizhny Novgorod. Is a unique open-air museum, there are only stone houses, the history of the oldest of which dates back to the middle of the 18th century. Officially there are 35 monuments of architecture. The most famous landmark is the Church of the Nativity. The Spit of Nizhny Novgorod is one of the main natural landmarks in the historical centre of Nizhny Novgorod. It is located at the confluence of the Oka and Volga rivers. The historic centre of Nizhny Novgorod is the downtown of Nizhny Novgorod with historical buildings in the borders up to 1917. A large number of ancient buildings, natural landmarks and historic districts are found in the area. In the old city there are buildings of different epochs and architectural styles, including Neo-Byzantine, Stroganov's Baroque, Empire, Modern. These include the medieval Kremlin, 19th-century mansions and Stalinist monumental houses.